The case for wearing earplugs is as clear-cut as that of strapping in when driving. PRO-17 earplugs offer excellent protection without compromising sound quality; they could be the wisest investment you make in your playing. Comfortable, custom fit. Superb response and shielding. Represents excellent value - you can't put a price on your hearing. ACS (Advanced Communications Systems) was started by musician and audiologist Andy Shiach. For over two decades it has manufactured custom earplugs and in-ear monitors (both utilise the same silicon moulding technology). 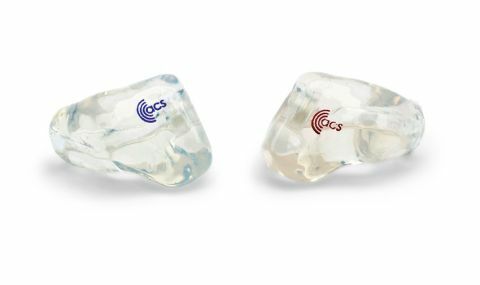 ACS's newest PRO range of custom earplugs is not only cheaper than the previous generation of custom earplugs, they can also be converted to in-ear monitors at any point. To order custom earplugs an accurate measurement of your ear canals needs to be taken; this is done by carefully filling them with quick-setting silicon. Though based in Banbury, ACS has a network of specialists across the UK who can do this locally. "ACS claims that the PRO-17 plug has the most accurate response of any hearing protector in the world"
The process - which is an unusual but not uncomfortable sensation - takes a little over 10 minutes. ACS keeps your details on file so if earplugs are damaged or lost, replacements can be made without having to start again from scratch. Like every other part of your body, your ear canals are affected by the passing of time and so ACS recommends updating your measurements every four years. PRO earplugs are supplied with a choice of attenuating (volume-reducing) filters. We opt for 17dB filters, though as the filters are interchangeable it is possible to own one pair of earplugs with multiple filters. The finished plugs are a comfortably snug fit and, being transparent, are also discreet. ACS claims that the PRO-17 plug has the most accurate response of any hearing protector in the world as it attenuates evenly across all frequencies. In plain English this means you should hear a full spectrum of sound, only 17dB quieter. We find very little in ACS's description to argue with, as our plugs manage to turn the volume down without affecting the quality of sound. So, the hiss and wash of our cymbals is still present, our snare sounds crisp as ever and there is nothing woolly about the bass drum; it's just quieter. Turning our attention to the rest of the band it's evident that all aspects of each individual's sound are present and correct, again reduced to a less painful level.